Introducing the KORG Legacy Collection – DIGITAL EDITION; stunning software versions of two Korg digital synthesis masterpieces – the M1 and WAVESTATION – plus the MDE-X multi-effect plug-in. Now you can get the classic sounds of these two ground-breaking synth legends updated for the 21st century and ready to rock your computer, in VST, Audio Units and RTAS-compatible formats! 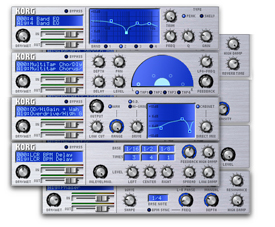 The KORG Legacy Collection delivers classic Korg synthesizers reborn as software. Taking advantage of the technical know-how uniquely available to the original manufacturer, Korg has received high acclaim for turning some of their most legendary instruments into software while adding modern parameters and up-to-date ideas. Now, joining the KORG Legacy Collection is the all-new Digital Edition, featuring the software incarnation of the legendary M1 and an enhanced version of the WAVESTATION software synthesizer. Back by popular demand: the definitive software version of the classic M1, the Korg synthesizer that established the PCM synth sound. Introduced back in 1988, the M1’s popularity steadily grew to exceed an amazing 100,000 users. As the first workstation synthesizer, it was a definitive element in the sound of the late ‘80s through early ‘90s. Along with its innovative workstation concept, the M1’s AI (Advanced Integrated) synthesis system used PCM waveforms and digital effects to deliver polished, production-ready Program and Combination sounds. As a pioneer of PCM tone generation, it was notable not just for the reality of its sound, but also for the distinctive tonal character that demonstrated the high level of Korg’s voicing technology. From the famous “M1 Piano” sound through electric pianos, organs, synth pads, drums, and picked basses, numerous sounds available only from the M1 were taken up by musicians and producers around the world, and are still in use today. Although today’s high bit-rate and high sample-rate sound libraries deliver greatly improved audio quality, it is difficult to find sounds with real character, sounds that can’t be described purely in terms of specifications – sounds that are available only from the M1. 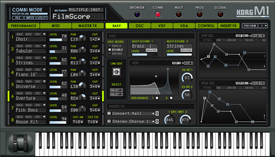 The M1 software synthesizer reconstructs the M1’s sound engine into an eight-part multi-timbral tone generator featuring up to 256-note polyphony. The M1 software synthesizer is a complete stand-alone virtual instrument; and also supports RTAS, Audio Units and VST plug-in formats to fit smoothly into a modern music production environment. The WAVESTATION appeared in 1990 offering its new “Advanced Vector Synthesis System,” which allowed combining and shifting between multiple complex waveforms. The WAVESTATION achieved worldwide honors – including “Hardware Innovation Of The Year” from U.S. Keyboard Magazine – and featured two radical innovations that opened up a revolutionary new world of sound that is still very much in demand. One was the ability to “mix” or “morph” between four oscillators to create new and unique sounds and textures, controlled from a vector joystick or a cyclic envelope. The second innovation was Wave Sequencing, which allowed the playback of different waveforms in a specific order to create evolving soundscapes, and unique rhythmic or melodic sequence patterns. 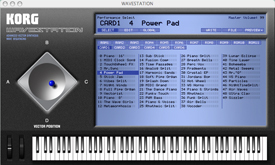 In 2004, the Korg Legacy Collection introduced the WAVESTATION software synthesizer. All of the WAVESTATION and WAVESTATION-SR factory data – 550 Performances, 385 Patches, 484 PCM waveforms, 55 types of effects – was included in this original release. 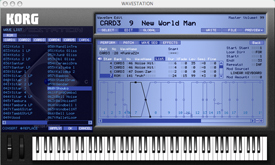 The new WAVESTATION software synthesizer Version 1.5 adds all of the PCM data, Patches and Performances contained in the six original optional ROM cards – more than 250 Performances, 250 Patches, 250 PCM waveforms and 150 Wave Sequences – long sought after by many current WAVESTATION owners. The WAVESTATION v1.5 software synthesizer opens new sound programming territory, providing more than 1,400 preset sounds plus a massive collection of additional PCM waveforms and Wave Sequences. Best of all, the WAVESTATION v1.5 software synthesizer is able to import original WAVESTATION series data via SysEx (SYX) files. MDE-X is the awesome multi-effect plug-in first introduced in the Korg Legacy Collection, delivering 19 high quality effect types derived from the technical innovation and research behind Korg’s Digital Recorders, TRITON synthesizers, and effects processors. With the new Korg Legacy Collection – DIGITAL EDITION, MDE-X Version 1.2 is here, and now supports RTAS, as well as VST and Audio Units plug-in formats. Featuring a low CPU drain design, MDE-X v1.2 comes equipped with 128 immediately useful and editable effect programs perfect for sound design, recording, mixdown sessions – even live performance! Для получения более подробной информации о программе "KORG Legacy Collection – DIGITAL EDITION" вы можете посетить сайт производителя.